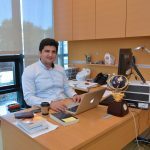 Dr. Rashad Ibadov is an Assistant Professor of Law at the School of Public and International Affairs, ADA University, where he teaches ‘Legal and Political Theory’, ‘Public Law’, ‘International Human Rights Law’ and ‘EU Law’ courses. Mr. Ibadov received his Doctor of Laws (LL.D) from the European University Institute in Florence, Italy (2013). He has been a doctoral visiting fellow at the Graduate Program of Harvard Law School (2009-2010), and for the previous year a visiting scholar at Boalt Hall School of Law at the University of California, Berkeley. He has an LL.M degree from the Faculty of Law, Lund University, Sweden (2004-2006), and LL.B degree (high honor) from the School of Law and Social Sciences, Khazar University, Baku, Azerbaijan (1999-2003). His areas of research interests include law and religion, political philosophy, legal theory, constitutional law, citizenship and international human rights law. Rashad won number of prestigious scholarships, such as, the Ministry of Foreign Affairs of Italy Ph.D. Scholarship (2006-2010); the Swedish Development and Co-operation Agency (SIDA) LL.M Scholarship (2004-2006); Erasmus Mundus IMRCEES Visiting Teaching Scholarship (2014); Civil Society Scholar Award (2014 – 2015) and the Raul Wallenberg Institute scholarship for the traineeship at the International Bar Association in London (April/September, 2006).